Give your entertainment zone that integrated look with our sleek and stylish TV Floor Stand. 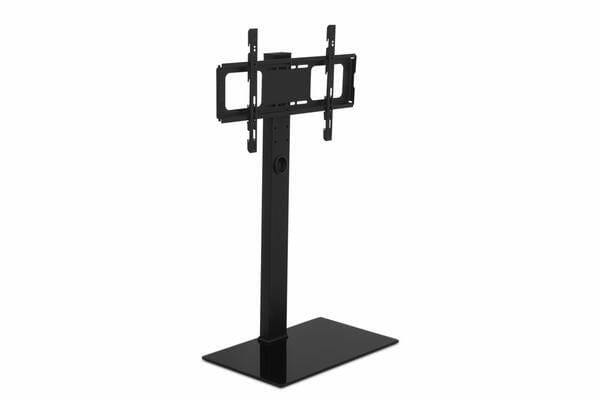 With a seamless design that incorporates your TV screen with other multi-media equipment into one ensemble, the TV floor stand is simply exceptional in every way. 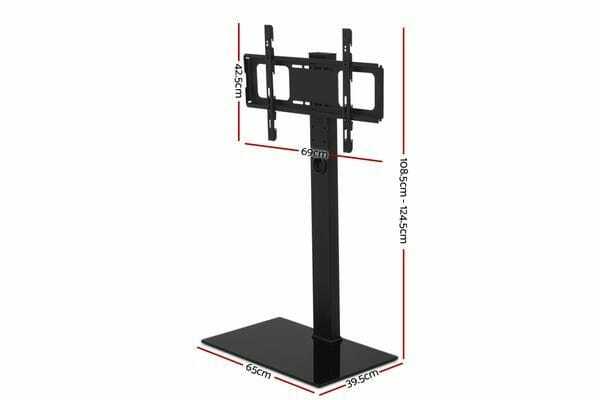 The black powder-coated TV floor stand can easily hold any TV screen of between 32 inches and 70 inches and comes with flexible mounting for various VESA measurements ranging from 200mm x 200mm to 600mm x 400mm. In other words, no worries with getting your favourite TV screen up there. Plus, the floor stand also has a 350 swivel for alternative viewing positions and an adjustable height of between 108cm and 124cm for a comfortable sight line. Not least, the MDF top shelf and tempered glass bass allows you to store your home theatre system or other preferred AV equipment safely and steadily for total entertainment immersion from one spot.